Today we review a product called Biotin. In today’s day and age, your appearance plays a vital role in your day to day activities. Looking after your skin, nails and hair will not only make you feel better, but it makes sure you have time to worry about more important things in life. Biotin is a B vitamin and claims to promote the growth of hair and nails whilst also supporting cellular energy production. This product supports the health of the nerves in your digestive tract and is essential in processing fats and amino acids. If you are interested in this product, read our review below. This product contains 10,000mcg of Biotin in 1 veggie capsule. 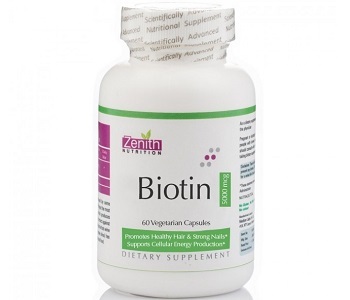 Biotin acts as a coenzyme in the body that helps to metabolize amino acids, glucose and fats. Biotin helps to nourish your hair, is very good for strengthening brittle nails and helps to energize the cells in your body for optimum growth and functioning. This product does not contain any fish, gluten, lactose, flavor, sugar, salt or color and it is vegetarian-friendly. This product is to be used as a dietary supplement. Adults can take 1 capsule per day or as directed by their doctor. Normally Biotin would not cause any serious side effects, however, too much Biotin in your system can have adverse effects. These effects include acne, frequent urination, diarrhea, nausea, increase your blood glucose levels, drug interactions and respiratory problems. It may also cause an allergic reaction. If you are pregnant or nursing, are a diabetic or a hypoglycemic it is strongly advised that you speak to your doctor before taking this product. You can order this product directly from the manufacturer’s website. One bottle, containing 120 veggie capsules, will cost you $9.51. Unfortunately, the manufacturers of this product are based in India and currently only ship their product in that geographical region. If you live in the US, it will be better to order this product from another retailer, like Amazon. Zenith Nutrition states that they will refund the costs of the product and the shipping and handling fees you incur if you decide to return the product. However, in order to be eligible for the refund, you must let the manufacturers know that you are unhappy with the product within 24 hours of receiving it. They also will not refund you if the product has been opened or used or if it is not sent back with its original box and invoice. Feedback regarding this product is mixed with 23% of reviewers on Amazon giving it a 1-star rating. Some reviewers stated that it did not work and gave them horrible acne. We like that this product is vegan-friendly and that it has a high dosage of Biotin in order to ensure maximum hair, nail and skin support. We also like that this product is reasonably priced if you compare it to similar products on the market. However, we are a bit put off by the negative reviews we read on Amazon. We also don’t think this product has a good guarantee policy at all. It’s also quite a shame that you cannot order this product directly from the manufacturers if you are stationed outside of India.